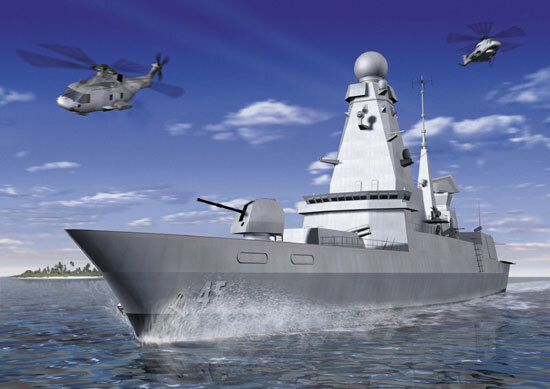 Of all the many defence projects that we have looked at in the last months, few approach the scale of insanity and expense of the UK's current plans to provide air-defence ships for the Royal Navy. Just about every decision taken has been flawed, with the result that we are to receive fewer, less-capable ships, later than anticipated, at a vastly increased cost. We are, of course, referring to the Type 45, currently under construction, about which we wrote briefly in an earlier post. But the sheer scale of the disaster – which is effectively wasting £2.4 billion of our hard-earned money – deserves a separate post, not least because of the baleful effects of European co-operation in the project. The project itself actually has its genesis in 1985, with the ill-fated NFR-90 (NATO Frigate Replacement for 90s) programme, a multi-national attempt at designing a common frigate for several Nato nations, including France, Germany, Italy, the UK, the United States and Canada. Inevitably, with such an ambitious project and with such disparate requirements, the project could not succeed and it was abandoned in the early 1990s, after US and the UK had withdrawn, the latter in 1989 after fears that the design would not meet the requirements for replacing its ageing Type 42 air-defence destroyers. Not deterred by the difficulties inherent in multi-national projects, however, the then Conservative government opted for a "European" solution, setting up in 1992 the Horizon "Common New Generation Frigate" project with France and Italy. This is a company jointly established by EUROSAM, a joint venture company formed by the two French companies Thomson-CSF (now Thales) and Aerospatiale Matra (now part of EADS) and the Italian company Alenia Marconi Systems) and UKAMS (a subsidiary of Matra BAe Dynamics, UK). The system comprises two parts, the missile itself, called the Aster, and the "Sylver" launcher. Aerospatiale Matra is responsible for the missiles and Alenia Marconi Systems for the launchers, actually built by DCN of France. The project turned out to be a disaster, and in April 1999, the UK pulled out of the platform component. The National Audit Office estimated the loss to the MoD at £537 million, including the costs of refitting existing warships to cover the delays in procuring new equipment, leaving the Ministry with a problem it did not want. Unfortunately, however, it continued with PAAMS enabling the partners to sign up to a development and production agreement at a cost to the MoD of about £1 billion. From the outset, the underlying thinking of collaborative development was sound, in that the development costs of building a relatively small number of ships (the MoD originally projected 12) was so high that it made absolute sense to try to spread the cost over a larger number of platforms. But, having pulled out of the Horizon project, yet still being committed to the French missile system, there was no prospect of collaborative development with other partners and, by default, the MoD was left with no option but to commission a British design. Over term, however, delays and more delays occurred, with the first ship not now due for commissioning until September 2008. The MoD has only confirmed orders for six of the twelve ships and, currently, the Defence Procurement Agency is forecasting a price of £6 billion for just six ships, double the original cost. In theory, the Aster missile is the most advanced in the world and the combination of the British radar and the missile gives the ships world-beating performance – again in theory. The system is, however, designed to deal with advanced Soviet systems which were on the drawing board when the Aster was first envisaged, but since have not materialised. Existing systems are more than adequate to deal with any known threats. As importantly, the current French launch system is capable of handling only anti-aircraft missiles. The US system can also fire Tomahawk cruise and ASROC anti-submarine missiles, making the Arleigh Burke class truly multi-purpose ships. Yet, to save money, the Type 45s are not even to be fitted with Sonar detection equipment. Our Navy is to be equipped with a single-purpose ship which, in a campaign where there is no significant air-threat, will be of little use. Purchase of the US ships, at a cost of £600 million per platform, would have saved the British taxpayer £2.4 billion and, on the basis of the Australian deal, they could have been built in British yards, safeguarding jobs. The tragedy of it all is that it is too late. The contracts have been signed and the funds committed. Once again, we are paying for the obsession with European collaboration.